ILMA Education: Eid Mubarak Everyone! These are the last lot of Eid ul Adha cards that my prekinders made for this Eid. Subhanallah, the Ka'bah is so easy to symbolise - a black square with a gold door and gold strip (writing) across the top. It is easily recognisable so, alhamdulillah, I was able to think up of the many art and crafts for children to make. 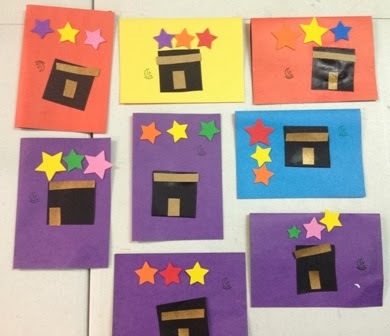 To make these cards, the children chose the colour of their card. I then handed out a black square and two gold rectangles. The children glued the gold strips onto the black square then they glued the Ka'bah to their card. Next they were given stars stickers to attach to their cards. Finally they craw pictures and write their names on the inside. Quite easily done!